QUITO, Ecuador, October 9, 2013 (ENS) – Decisions in two branches of Ecuador’s government have set the stage for a final battle over oil extraction in Yasuni National Park, a mega-diverse rainforest reserve in that country’s portion of the Amazon Basin where President Rafael Correa has decided to drill for oil. Last Thursday, Ecuador’s congress approved drilling in two oil concessions in the northeast corner of Yasuni National Park – the Ishpingo, Tambococha and Tiputini (ITT) block and the adjacent block 31, which together hold more than 20 percent of the nation’s petroleum reserves. Ecuador’s 2008 constitution prohibits extractive industries in protected areas, but allows for exceptions in cases of national interest. Legislators from Correa’s Alianza PAIS party and allies approved the resolution of national interest for drilling in Yasuni with a vote of 108 in favor and 25 against. Though expected, the vote was a blow to environmentalists who had supported the government’s Yasuni-ITT Initiative, which sought US$3.6 billion in donations to compensate Ecuador for leaving 846 million barrels of oil in the ground in the ITT block. The initiative asked the world to help Ecuador protect the park’s extraordinary biodiversity and Tagaeri-Taromenane Indians, and avoid the release of 400 million tons of carbon into the atmosphere. Correa blamed the international community for the initiative’s failure, noting that it had raised less than one percent of its goal in six years, but environmentalists claimed that the government’s 2008 default on international debt and various contradictions sowed doubt among potential donors. For example, the state oil company Petroamazonas has been working in block 31, inside Yasuni National Park, for almost two years under a permit that predates the constitution, and is nearly ready to begin drilling there. Observers noted that Petroamazonas would need to mix the heavy crude from the ITT block with light crude from block 31 in order to pump it through the pipeline over the Andes to the port and refinery on Ecuador’s Pacific coast. A week before Ecuador’s congress approved drilling in Yasuni, the country’s Constitutional Court approved a request by the lawyer Julio Cesar Trujillo for a national referendum on the issue, and asked the National Electoral Council, CNE, to oversee the collection of approximately 680,000 signatures – five percent of the country’s electorate – a prerequisite for such a plebiscite. A coalition of citizens groups called Yasunidos has six months to collect those signatures and get them approved by the CNE for the vote to be held. Correa’s August 15 announcement that the government would exploit the ITT oil sparked street protests in Ecuador and criticism around the world. More than 100 scientists from 19 countries, including Ecuador, signed a statement opposing drilling in Yasuni National Park that was delivered to the congress in late September. 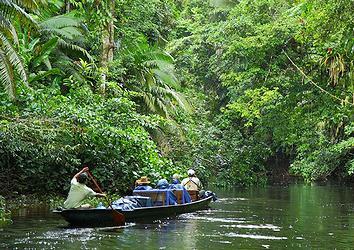 Ecuadorean opponents of drilling in Yasuni now see the referendum as their last hope. However, they will need to win a public relations war against a popular president whose government spends millions on propaganda. Esperanza Martinez, president of the Ecuadorean environmental group Accion Ecologica and one of Yasunidos’ organizers, explained that thanks to the initiative, Yasuni has become an emblem for Ecuadoreans. “The government has plenty of resources to position its message, and it has a great capacity to move the public, but we are confident that on this issue, the amount of information that exists and the number of people who believe in conserving Yasuni will give us positive results [from the referendum],” she said. The vast majority of Ecuadoreans supported the Yasuni-ITT Initiative when the government promoted it, but that support may be eroding. The initiative’s website now stresses government promises that drilling will affect just one-tenth of one percent of the forest and that funds from the sale of the oil will be used to improve life for all Ecuadoreans. The government runs frequent television and radio spots claiming that Petroamazonas will use the latest technology to limit its impact on Yasuni, and that the money will be used to build schools and hospitals. Biologist Kelly Swing, a professor at the Universidad San Francisco de Quito who has spent two decades working in Yasuni and has evaluated the environmental impacts of various oil operations in Ecuador, expressed doubts about the government’s promise to leave 99.9 percent of the forest intact. He cited cases in which oil companies planned to damage no more than two percent of their concessions, but because loggers and settlers used oil roads to enter the area, anywhere from 20 to 50 percent of the forest was cut destroyed or degraded. He said that Petroamazonas’ recent work in nearby block 31 does not bode well for the promised environmentally friendly drilling in the ITT block. One of the most contentious issues during the congressional debate was the possible impact of oil extraction on the Tagaeri-Taromenane – nomadic clans of Waorani Indians who live in voluntary isolation there. The congressional resolution states that if those people are seen during oil operations, work must be suspended until protocols to protect them are applied. Eduardo Pichilingue, coordinator of the Ecuador’s Observatory of Collective Rights, who spent two years organizing the Environment Ministry’s plan for protecting the Tagaeri-Taromenane, said that those groups move throughout the park and beyond its borders. He explained that oil operations, logging and farming around Yasuni have led to various violent incidents during the past two decades, the most recent of which were clashes between Taromenane and Waorani last March in oil block 16, just west of the national park, that resulted in approximately 30 deaths. 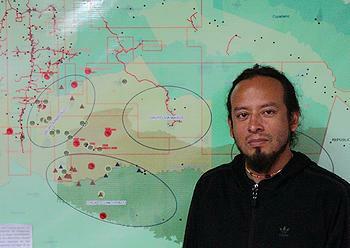 Pichilingue predicted that oil operations in ITT and block 31 would push the Taromenane into other areas where conflicts over hunting grounds would likely lead to more violence. 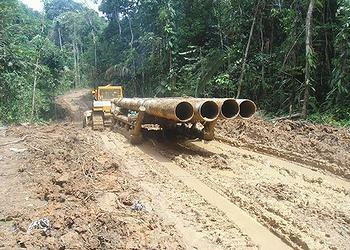 The approval of drilling in Yasuni is the latest step in an ongoing effort to increase Ecuador’s oil production. Various concessions to the north and west of the park are under production and Petroamazonas is negotiating with indigenous communities in three oil blocks to the south of it, where an additional 13 blocks are being offered to foreign companies through an auction known as the 11th Round. The Ecuadorean government gets about half of its revenue from the petroleum industry, and Correa has spent more of that money on social programs than previous presidents, which has led to a reduction of the percentage of Ecuadoreans living in poverty from 37 percent to 27 percent. Despite rising oil production and high market prices, the government has had trouble covering the cost of its social programs, infrastructure improvements and expanded bureaucracy. Following its 2008 default on international loans, the government resumed borrowing, primarily from China, which has lent Ecuador US$9.3 billion, some of it as advance payment for future oil deliveries. Alberto Acosta, who served as minister of energy and mines in Correa’s first administration but ran against him in the 2013 presidential election, claimed that debt played a role in the decision to drill in Yasuni. He insisted that the government has other options for raising revenue, such as reducing fuel subsidies, which will cost the state US$4.5 billion this year. According to a study by the Center for Economic and Social Rights, the government could raise more money by increasing the tax rate of the country’s 130 largest corporations by 1.5 percent than it can earn from the ITT oil. Acosta warned that by increasing the government’s reliance on petroleum, Correa is contributing to a crisis in the future, when Ecuador’s oil reserves fall too low to continue exporting, which he expects it to happen in 10 to 15 years. “The oil will run out. Sooner or later, we will have to face that challenge,” Acosta predicted.